I used to have a love hate relationship with make up brushes. I love that they do the job so well but I hate it that I have to clean them. I bought specialty products for brush cleaning and used them for many years. Some were the spray on / non-rinse type. Basically you spray them on and rub off the gunk in your brushes on tissue paper until the tissue does not get coloured anymore. It takes hours to clean my brushes (I used like a total of 10 brushes then) with this type of product. I gave them away. For a long time I used baby shampoo on my brushes, until I tried the Daiso Detergent for Puff and Sponge (can also use on brushes!). Life changer. It now takes me less than a minute to clean each brush. 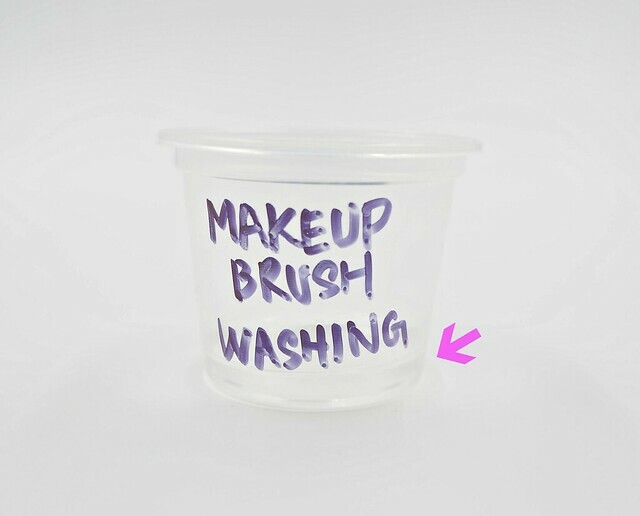 A small container that is roughly as deep as the height of your brushes. I re-use one disposable plastic container from SKP (highly recommended although not a need). Daiso Detergent for Puff and Sponge. I saw plenty when I bought mine but I heard, the Daiso Detergent sells out quickly, so be fast. And here’s a step by step guide on how to clean your make up brushes. 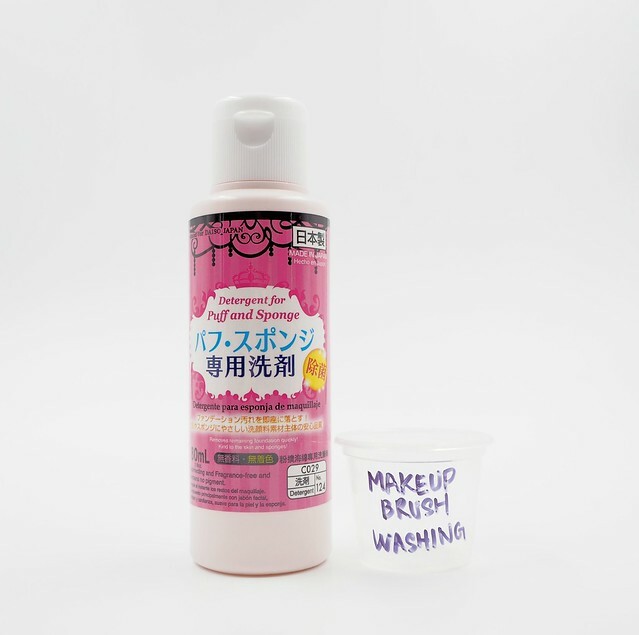 Pour a small amount of the Daiso Detergent into your small container. Using a container helps to keep the detergent within it and makes the less mess I find. Pour up to the level indicated by the arrow is good enough for one brush. 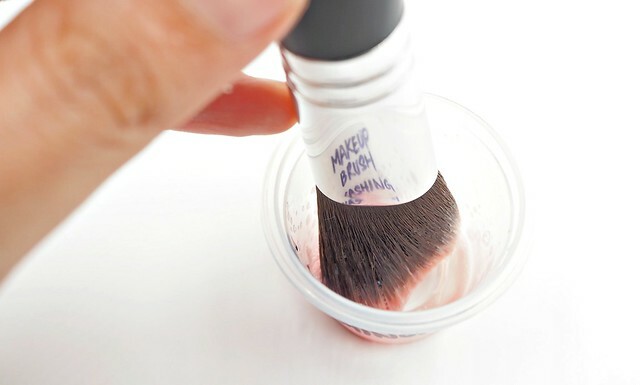 Dip your use brush into the container and swirl to get product onto the brush. Wash under running water quickly. If you can, take special care to avoid water near the ferrule (the area near metal band on your brush) to avoid loosening the glue over time. For me priority is to have the brush cleaned, so I protect the ferrule as much as I can but don’t fuss when water goes over it. Dry your brush on a paper towel / lint free cloth. I used that ESOD Angled Brush on pure iron oxides (pure color minerals) to test colors for ESOD, it would have been a nightmare to clean with other detergents / products because iron oxides are super pigmented and really hard to get off but look, at least 90% cleaned in less than a minute. 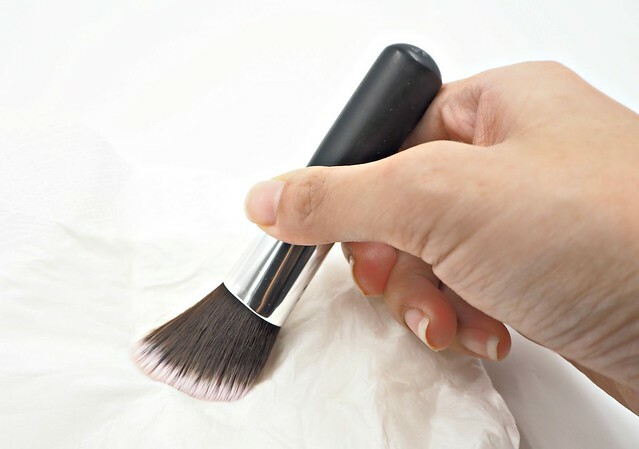 Air dry your brushes overnight, on a lint free cloth. I put a box lid or something under my brushes when they are drying to elevate them to an angle so that there is less chance of water getting into the ferrule. Thats all! Simple, fast and effective. Try it and let me know how it works for you! Super quick make up that lasts 10 Eyeliner tips and tricks My favourite make up removal products My hair secrets | What’s yours?